Once you register and have a username and password, you may login. You will see two main sections (seen below). 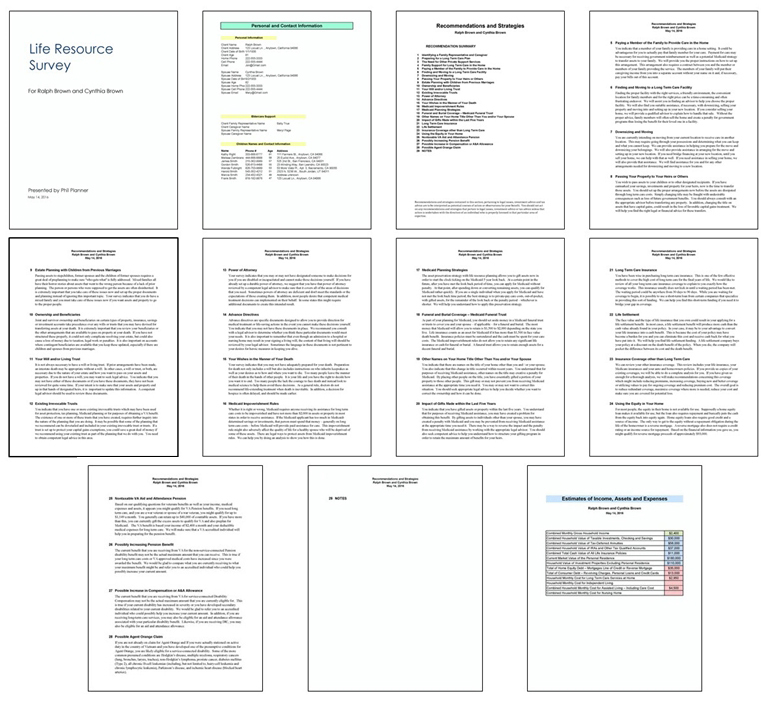 The first section is used to create a Life Resource Survey (for an aging senior). 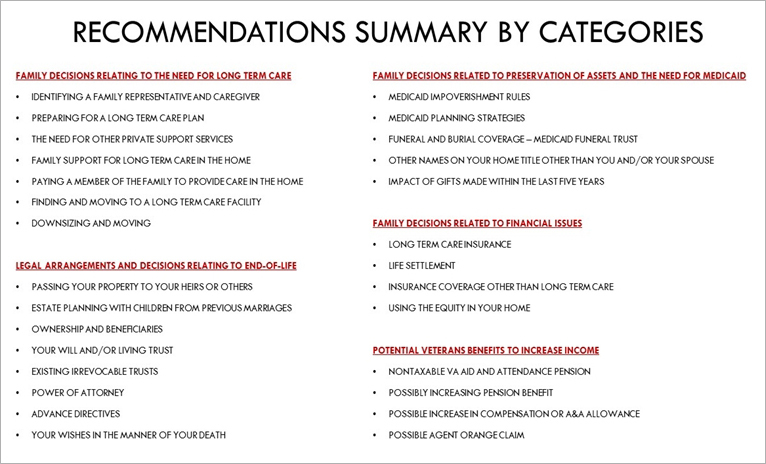 The second section is used to create a Retirement Planning Survey (for a retiree). It is up to you to decide whether or not to charge a fee to create a survey for any of the above. If you charge a fee, we highly recommend you use a letter of agreement such as the sample one we will furnish you. Having an agreement might help you avoid repercussions. 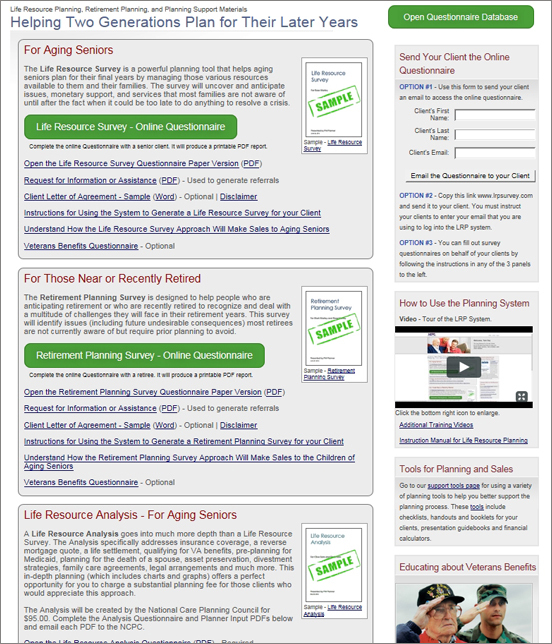 You can access the online "Life Resource Survey - Online Questionnaire" or "Retirement Planning Survey - Online Questionnaire" using the two green buttons shown above. You can also have your client complete the online questionnaire. Use the instructions and form in the right section to send your client the questionnaire. 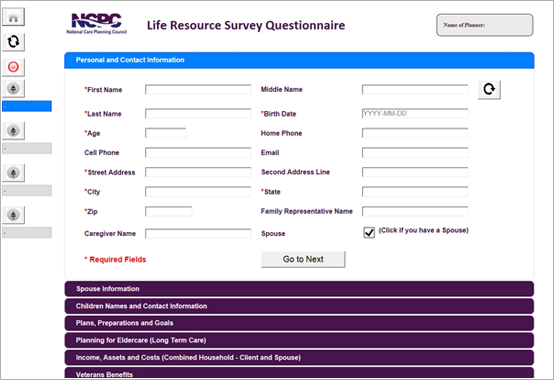 Below is a screenshot of the actual "Life Resource Survey - Online Questionnaire." You can save up to 30 questionnaires in your online database we provide. 5. What do the Surveys recommend? Hopefully it will answer your more specific questions. If not, call us. We would be glad to chat with you.